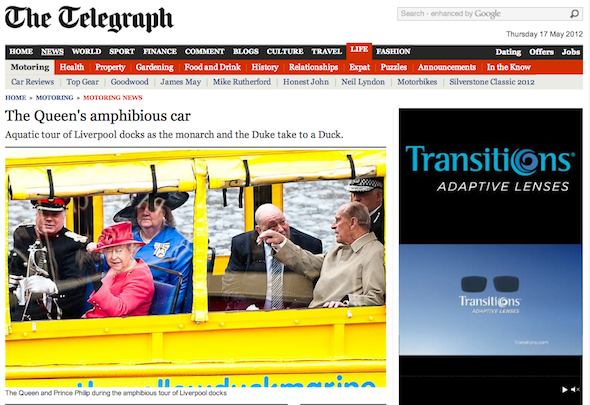 Check out our photo from the Queen’s visit to Liverpool on The Telegraph website! You can find our full blog on the Queen’s visit here and be sure to check out our homepage for more PR, commercial and event photography. This entry was posted on Thursday, May 17th, 2012 at 7:24 pm. It is filed under PR and tagged with albert dock, Diamond Jubilee, docks, Her Majesty The Queen, liverpool, maritime museum, photo, photograph, photographers, photographs, photography, Photography Liverpool, photos, Royals, telegraph, the duke of edinburgh, The Queen, Tour, Yellow Duckmarine. You can follow any responses to this entry through the RSS 2.0 feed.